Over the last hundred years, zombies have become a part of our culture. The breed of living dead that modern society is most familiar with is the flesh eating variety introduced to the world by George A. Romero’s revolutionary midnight movie Night of the Living Dead (1968). A carriage is bumping along the dark roads of Haiti one evening, carrying lovers Neil Parker (John Harron) and his betrothed Madeline (Madge Bellamy). They are disturbed to witness a burial taking place in the middle of the road, a ceremony the driver explains that the natives carry out to ward away sorcerers looking to reanimate the corpses. The couple soon witnesses the full breadth of the island terrors when a wicked-looking soul named Murder Legendre (Bela Lugosi) is seen with his legion of zombies trudging down the hillside. Neil and Madeline are dropped off at the lavish plantation of Charles Beaumont (Robert Frazer), a seemingly kind fellow that the two met while aboard the ship to the West Indies. Beaumont immediately insisted on holding the wedding ceremony at his estate upon finding out the couple’s plans. But Beaumont’s motives are less than charitable; he has become smitten with Madeline and seeks to win her heart over. Beaumont is later driven by a zombie to the sugar mill of Legendre, a factory populated by the undead. The zombies slave away at their tasks, not even ceasing their motions after one of their own falls into the crushing gears of the sugar grinder. Beaumont speaks with the devilish Legendre, pleading with him to devise a plan so that Madeline may be his. Legendre proposes using a deadly toxin to kill the girl so that he may later resurrect her from her eternal sleep. He is at first wary of the idea, but eventually Beaumont's desire gets the better of him and he pours the poison into a flower, the aroma spelling doom as Madeline innocently sniffs at it. Madeline gives into the throes of death after seeing Murder’s face staring at her in the reflection of her wine glass. Legendre and Beaumont sneak into the rotting cemetery by night, Murder using the cadavers of his old rivals to break into the crypt and bring the casket forward. The dastardly group flees into the shadows with their treasure...as Neil stumbles into the tomb and screams at the ghastly sight that meets his eyes. Neil later consults with Dr. Bruner (Joseph Cawthorn), a missionary who is knowledgeable of the magical practices that take place on the island. He believes that Madeline is not actually dead but rather in a catatonic state under the influence of powerful drugs. To this end, Neil and Bruner seek to find Madeline and restore her to normal health. Back at Murder’s seaside castle, Beaumont has become disturbed by Madeline’s lifeless state. He beseeches Murder to restore her vitality - but the sorcerer says he has other plans for the woman. Striking up a toast with Beaumont, Murder gleefully watches as Beaumont becomes aware that his glass is filled with the very same toxin as the one used to “kill” Madeline. Neil and Bruner head into the “Land of the Living Dead” to rescue Madeline from Legendre’s dark abode. Inside the castle, Beaumont is slowly going through the painful process of zombification, Murder delighting in his companion’s torture. Seeing his love on the balcony, Neil hurriedly rushes down the beach towards the brooding castle ahead. Sick with desperation and fever, he finally collapses upon the staircase. Murder spots the fallen hero and, coming up with an insidious plan, uses his hypnotic powers to summon Madeline and force her to stab her own lover in the throat. But Madeline’s will struggles with the task just long enough for Bruner to intervene before any damage is done. Neil awakens in time to see Madeline rush out to the castle’s rotted ledge. He saves her as she sways over the steep cliff...but is distressed to see that Madeline remains a soulless shell. Legendre uses this opportunity to order his zombies to attack Neil as he hangs over the cliff’s edge. The living dead press forward, the bullets from Neil’s gun piercing their flesh but never breaking their unspoken command. Neil ducks out of the way and the zombies mindlessly plummet off the mountain. Murder then attempts to escape Bruner and Neil. Summoning his magical powers, Murder is stopped mid-spell as Beaumont stumbles from the castle and hurls the sorcerer into the sea, the doomed Beaumont falling after him. With Murder now dead, Madeline’s spell is broken and she lovingly smiles at Neil as they passionately embrace. 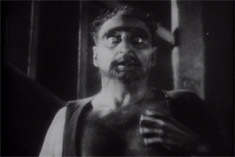 The viewing public of America had never been exposed to a zombie prior to this film, the only previous mentioning of it appearing in William B. Seabrook’s 1929 novel The Magic Island. 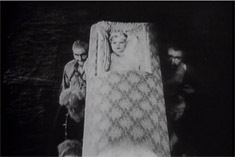 White Zombie introduced spectators to the wide-eyed, shambling corpses we have all come to love, further emphasizing the undead fears seen in the 1931 films Dracula and Frankenstein. The film works extremely well, despite initially being panned by critics upon its first release. For having only been shot in eleven days, the picture is marvelously steeped in strange and foreboding atmosphere. The plot devices and characters may come off as slightly melodramatic at times, but it’s all part of the charm. The film almost works on the same level as a dream, with beautiful and haunting images flitting before our eyes. 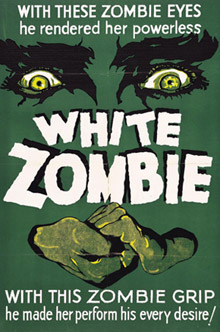 Director Victor Halperin went on to direct other chiller features such as Buried Alive and Torture Ship (both 1939), and the “sequel” to this film, Revolt of the Zombies (1936). The cast all perform their roles adequately, most of them being faded stars from the glory days of silent cinema. John Harron and Madge Bellamy play the requisite lovers, all fawning and doting as a couple should be. Bellamy retains a lovely, blank stare during her zombie scenes, the dull look in her eyes almost appearing sinister at times. Robert Frazer is enjoyable to watch as the scheming Beaumont and he is able to channel some sympathy from the audience later during his redemption. Joseph Cawthorn is the Van Helsing of White Zombie, the clever old man who uses the power of his mind to vanquish evil. He even works some humorous bits into his performance to keep from being too stoic. The most iconic element of the film, as you might have guessed, is the stunning performance of Bela Lugosi as the notorious Murder Legendre. The devilish makeup applied by maestro Jack Pierce gives Lugosi a satanic and immortal look of wickedness that suits his dark spirit. 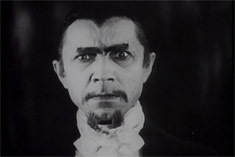 More so than in Dracula, Lugosi is able to delightfully play with his overwhelming evil in this film, smiling coyly and grinning like a hyena at his own depravity. The menacing stare and clasp of his hands registers a genuine feeling of fear in the viewer; you begin to feel as if Lugosi truly does possess devastating magical powers. It was personally more enjoyable to watch Lugosi in this film than almost any other. He’s dastardly through and through…and he’s enjoying every minute of it. What more evidence does one need in deciding to view White Zombie? It remains in the public domain as well, so it only takes a mere click of the mouse to bring this piece of essential horror history to your computer screen. The power that it possesses has not diminished one iota in over seventy years. Dig into this cold grave and behold the magic of those ever-staring, hypnotic zombie eyes. When he's not snatching cadavers with his gorilla manservant, Jose Cruz keeps busy by feverishly writing on the horror genre. His grisly endeavors include Cold Reads, a regular column on horror literature over at Classic-Horror.com and contributing film reviews to The Blood Theatre. He also runs a madhouse called From Beyond Depraved where he blogs about his passion for terror in all its varied media forms through essays, reviews, and mild rambling.